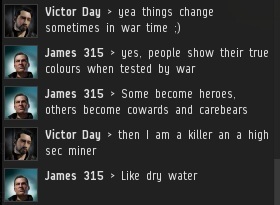 Previously, on MinerBumping... After just a single bump, highsec miner Victor Day flew into rage and threatened to attack me with a PvP fleet. I was skeptical of his claims to have powerful friends in nullsec. But could he have been telling the truth? To burnish his credentials as a secret nullsec ace, Victor name-dropped the Fountain region, where a tremendous war was just wrapping up. I was eager to glean as much intel as possible from Victor. After all, if the powers of nullsec intend to encroach on my highsec domain, that's something I need to know about. I didn't want to take a break from my duties as Saviour of Highsec, though, so it was time for more multitasking. I continued to show love to the locals. JackFrost Saissore still thirsted for blood. He was afraid to undock while I was in system, so he repeatedly asked others for news of any combat developments. 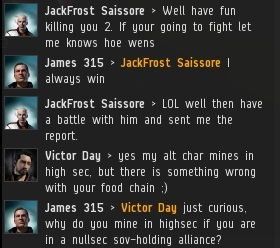 At last, Victor gave me the name of his alt's affiliation: Fidelas Constans, a CFC alliance with territory in northern nullsec. 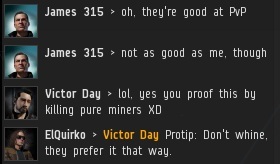 Victor insisted that he was a skilled PvP'er, but when it suited him, he was just a "pure miner". It's a sad state of affairs that people with space in nullsec prefer to PvE in highsec. I felt it was a prime opportunity to interview the carebear and find out why he spurned his alliance's hard-won nullsec territory. 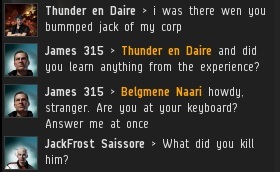 Nullsec alliances sometimes put their members in a Catch-22. They are required to PvP during wartime, which costs money, but they are not allowed to PvE to make money during wartime. The solution is to PvE on highsec alts that have no affiliation with the alliance. 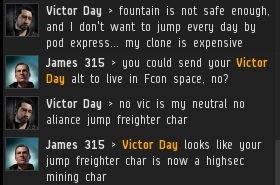 Victor's next excuse was that Victor Day needed to remain a neutral so he could safely pilot a jump freighter with it. Or, in this case, to use it to fail to mine in highsec. Victor's entire identity was overwhelmed by cognitive dissonance. 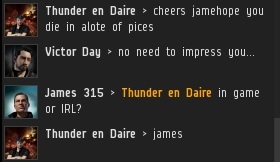 He was really a brave, loyal soldier of Fcon, even if it appeared he was a draft-dodging highsec carebear. 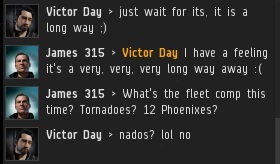 I reminded Victor of his threats to bring in a PvP fleet to attack me. They were supposed to be ten minutes away. As the clock ticked, my chances of getting to see this PvP fleet were diminishing. 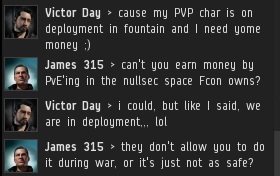 Maybe the CFC wouldn't divert resources from Fountain in order to defend the honour of Victor's highsec mining alt? While to expect the unexpected is something good to learn I have a sneaking suspicion that Victor Day will be unable to produce an unexpected scenario. 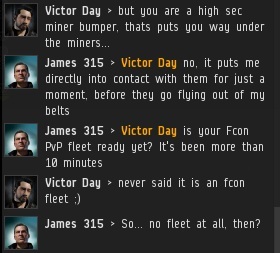 To be fair it must be hard being in FCON. I always expect the unexpected when it comes to nullsec pvper/highsec miners. thats some kind of a bipolar disorder if ive ever seen one. "Victor's entire identity was overwhelmed by cognitive dissonance." SUCH GLORIOUS GOLDEN SENTENCES OF GOLD! Mmmmmmmmmmmmmmmmmmmmmmm, delishush! Give next entry now pls. I was laughing pretty hard at "Howdy stranger. Are you at your keyboard? Poor chap. 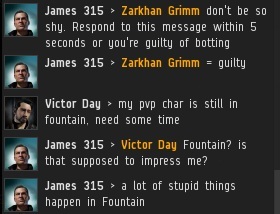 If he'd researched his fake identity for about 15 seconds he'd known FCON aren't deployed to fountain or anywhere near. But then, he'd know about jump clones too, I guess.